Saturday - every event professionals favorite day of the week. No, not because you can sleep in and not think about planning and execute that awesome event you have coming up. But because it's the day MeetingPlay gives you #MPtips - tips and tricks for event planning, event engagement how to's, Q&A's to some of the most frequented asked (or too embarrassed to ask) event tech questions - and so much more. This week's #MPtips topic? Event Automation. Recently we shared how Simone Giertz Get’s Shiz Done - Aka 3 Ways to Automate Your Event Planning. The thing is, not many of you realized how Simone tries to automate her entire life. From putting on lipstick to chopping vegetables to merely waking up. Fellow event professionals and event planners didn’t believe us when it came to automating events, however. In fact, they didn’t believe tasks of any capacity could be automated. So we were committed to not stop at just sharing Simone. There are people automating the way they use their cars, tinder, heck – students at Purdue came up with a way to automatically make breakfast. Even better, there is automatic girlfriend text apps. 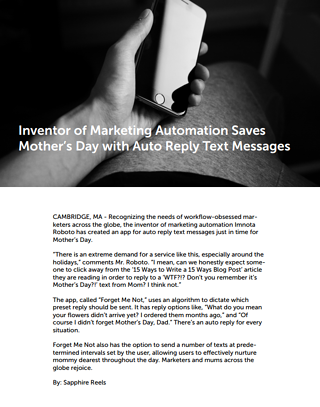 So if you can automate your texts to your girlfriend, putting on lipstick, tinder, making breakfast, and more – why can’t you automate your event planning and event engagement? I mean – after all, Nihad Abbasov aka ‘Narkoz’ – not only automated software scripts to respond and alert to his wife if he was running late – he automated scripts for being late to work when he was hungover. While we at MeetingPlay may not have an app to automate texting your girlfriend, or work when you're hung over - we do have an app that can help you increase event engagement, delight your sponsors, integrate live polling, provide analytical reporting, and so much more. It’s Saturday – just think if you had automated tips and suggestions sent to your email box so come Monday morning, you could implement the latest ideas. (Oh wait, you can! Just subscribe to our blog). Want to learn how MeetingPlay's best mobile event apps can help you automate your events whether it be email, analytics and reporting, gamification and so much more?